How Many Cars Have We Been Married? Poetry from the Senior College at the University of Maine at Augusta. Reviews for How Many Cars Have We Been Married? 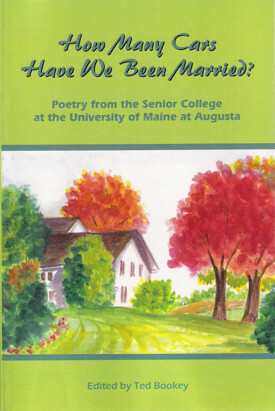 These are poems by twenty students at University of Maine-Augusta's Senior College. Ted Bookey has been teaching poetry classes there for several years, and this anthology represents his students' best work. These are the voices of experience, full of hard-earned wisdom and joy. Charles Acker, Betty Bernstein, Ellen Bowman, Carol Brewster, Roger Carpentter, Steve Cowperthwaite, Janet Favor, Meredith Nash Fossel, Alice Gifford, Marilyn Gordon, Claire Hersom, Sally Joy, Diane Lee, William Mather, Joan Nicholson, Alice Rohman, Anne Rosenthal, Carol-Lynn Rossel, Julian Sacks and Judy Schuppien. Sample from How Many Cars Have We Been Married? Noah's dim-witted god has a plan. But why should we leave our cubs, our herds, our dens? Our gods trust us and think we're safe. Listen. The rain has started. to become the new Ancestor. We did not ask for this.